In July 2017, this 38-year-old lady came in for her Skin Fitness Assessment. She had always been a sun-worshipper and would have used sunbeds before going on holidays to deepen her colour. In the last three years she noticed the uneven pigment in her skin getting worse and people had begun commenting on it. She had never had any issues with her skin so her skincare routine had been quite basic. 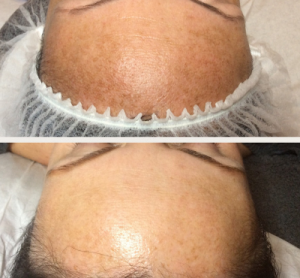 She had had microdermabrasion previously which would (unbeknownst to our client) have compromised her skin further. She began using our active skincare products and taking the supplements we recommended and also began having monthly treatments in-clinic. These pictures were taken 9 months apart. Sundamage in the form of pigmentation is one of the hardest things to treat in skincare so prevention is always best. 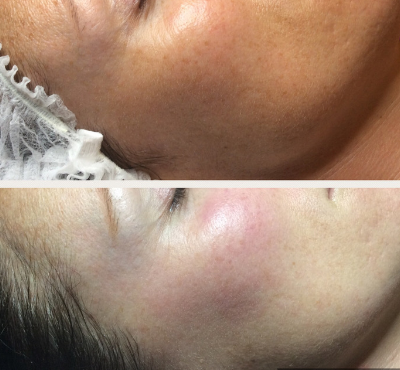 This client still has regular treatments and is careful to avoid excessive sun exposure.